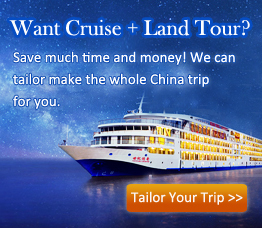 You are planning a tour to sail on the Yangtze River but don’t know which is the best ship? Here we have selected the top best-value Yangtze River cruise ships for your reference. They are not only the top cruises from renowned Yangtze River cruise companies, such as Century Cruises, Victoria Cruises, President Cruises, and so forth, but also provide great facilities and services onboard with very nice prices. Check the below to select your favorite best cruise ship to begin your Yangtze River cruise trip! 1. Victoria Jenna, Best American-managed Cruise, only from $382 - $469. Awards Winner: with the launch of Victoria Jenna, the Victoria Cruises has won a lot of honorable awards and recognitions, such as the "2011 TravelAge West Wave Award Editor’s Pick for Best River Cruise Line", "Best New River Cruise Ship in 2010". Besides, "Travel Weekly" recently also selected Victoria Jenna as a "Silver Award Winner for the Magellan Awards’ River Cruise Ship category". So travellers can enjoy the really good experience onboard the ship which was reputed by the world. American Management: since Victoria Cruises is the only cruise company managed by American group on the Yangtze River, people onboard the ship can be take good care of by the professional crews and get what they really want through the sailing. Private Balcony for Sightseeing: onboard Victoria Jenna, every cabin has been designed with a private balcony, which enables guests to enjoy the fantastic sightseeing without stepping out of their rooms and enjoy more private leisure time with family members and friends. Winter Cruises: Victoria Cruises offer winter cruises in December and January between Chongqing and Yichang cities with very nice price. Big News: During 2017, traveller guests choosing Victoria cruise ships to visit the Yangtze River can get, for free, the amazing experience of the great Three Gorges Dam Ship Lift, the most complicated ship lift system in the entire world. Check more detail information about Victoria Jenna! 2. Century Sun & Century Sky, Vessel Stars of Century Cruises, only from $396 - $469. Luxury Five-Star Cruise Ship: Century Sun and Century Sky, these two sister ships having been hired by the Viking Cruises perform professional to serve guests on the Yangtze River with the superior management concept from the Europe, and satisfy the needs and living habits of travellers well no matter they come from the western countries or other Asian, African regions. Large Space for Fun: Century Cruises has spared more spacious room for the entertainment and relaxing fun of travellers, instead of having built more cabins, which benefits the real experience and leisure of guests onboard and avoides the crowd enviroment on the ship. Check more detail information about Century Sun & Century Sky! Elegant Environment on Century Sun & Century Sky! 3. President No.7 & President No.8, Optimal Ships of President Cruises, only from $386 - $436. Brand-new & Large Vessel: President No.7 and President No.8 are sibling Yangtze River cruise ships and had their first voyage in April, 2013, ranking the top newest ship on the well-known river. Besides, they are the top largest Yangtze River cruises with the length of 146.8 meters and width of 20.2 meters that are also the maximum limitations of cruise ship on the Yangtze River. And people will feel very steady as on the land with the weight of 17,000 tons of the ship. High-standard Cruse Facilities: managed with the strict standards of a luxury hotel on the land, President No.7 and President No.8 provide rich types f facilities of high-standard in the public entertainment area and also in the cabins onboard the ship, therefore, guests onboard will receive the best experience on their holiday. Rooms Suits Your Group Size: there are totally 230 luxury cabins and suits with different sizes and facilities onboard the ship for the diverse needs of your group size, whether you travel alone or have fun with many people, you can enjoy a great time in the fine-decorated rooms and have nice sleep there with the cozy bedding articles. And among all, 100 cabins can be upgraded into triple rooms that are suitable for family guests. 4. Victoria Anna, Top Best-value cruise of Ever-victorious Victoria Cruises, only from $382 - $469. More Private Room & Private Balcony: onboard the cruise, in the deluxe cabins of 21 square meters, people can enjoy more private room than on other ship of Victoria Cruises. Besides, every cabin has a large private balcony, so people can enjoy the amazing natural sceneries along the Yangtze River in their own room and get real relaxed. Praised American Services: as the ship of the only American-managed cruise company on the Yangtze River, Victoria Anna offers professional and superior services for every guest from different countries and regions in the world. A lot of entertainment activities, delicious food and warm smiles of the staff will satisfy you every day during your trip. Cabins for Couples & Families: in the standard cabins on Victoria Anna, the two single beds can be put together into a larger double one, which suites couple guests and people travel with family very well. Winter Cruises: Victoria Cruises offer winter cruises in December and January between Chongqing and Yichang with the lowest prices. Certainly, you can experience for first time of the world largest and most complicated Three Gorges Dam Ship Lift for free if booking a cruise of Victoria Anna in 2017. Check more detail information about Victoria Anna! 5. Yangtze Explorer, Frequently Chosen Ship of World Celebrities, only from $1,097 - $1,497. Excellent 1-on-1 services: with 121 crews and the maximum capacity of 124, Yangtze Explorer offers the excellent one-on-one service for every traveller onboard the ship, so every guest can be taken good care of through the Yangtze River cruise trip. Selection of Famous People: many famous people, such as Bill Gates, Warren Buffett, Henry Kissinger, and so on, have chosen this top luxury cruise ship to spend their great time on the Yangtze River, so this ship has gained a lot of experience satisfying travellers with the outstanding facilities and amenities, large space for fun, great food and dining environment, and superior services. Note: For more detail info of each best-value Yangtze River cruise ship, please feel free to contact our professional Travel Consultant!